Despite the fact that Johnson Matthey silver bars are no longer produced, they still occupy one of the leading positions in silver bullion for sale market. 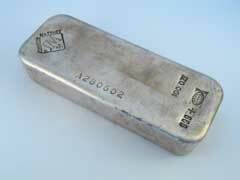 These silver bullion bars come in 100 oz size and insure superior investment value over a spot price of silver. In addition, low premium costs allow investors to maximize their investment potential with Johnson Matthey silver bars. Originally produced 100 oz Johnson Matthey silver bars were proudly stamped with unique serial numbers and Johnson Matthey company logo. Silver bars that were produced in the last years of production did not have such numbers. These silver bullions are easy to store, transport and are considered an overall excellent investment choice. Their unsurpassed liquidity will ensure you can easily resell them once you decide to do so. There are multiple benefits of investing in Johnson Matthey silver bars, namely, low average dealer premiums, world market acceptance, extreme liquidity and made from the highest .999 grade of silver available on Earth. These bars are also accepted forms of investment into your IRA accounts. American Academy silver bars< are also a great silver investment choice, scroll over to learn more about these silver bullions.